Gamblers who’ve ever thought it would be nice to swap their cards around from one hand to the next should play “blackjack switch”. 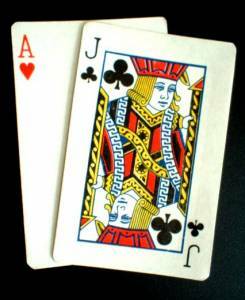 In this game, the player is dealt two blackjack hands. After the deal, the gambler is allowed to switch the upcard between these two hands, increasing the strength of one or both hand combinations. This is a tremendous advantage to a blackjack player. As you might imagine, other rules are stipulated to mitigate that advantage. The house edge on this game can be as low as 0.20% (using the “Russian” rules), so it’s a solid version of twenty-one players should know about. As always when playing 21, know how the various rules affect the house edge or you could end up playing at an inferior table. Unless otherwise noted, all rules of switch are based on the classic blackjack rules. 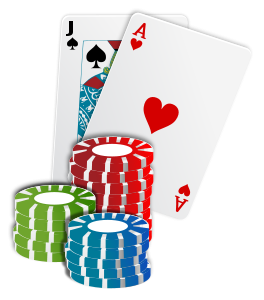 In most casinos, either 6 or 8 decks are used. Switching from six to eight decks increases the house edge by 0.02%. In most land-based gaming venues, the dealer hits on a soft 17, but you will occasionally hear of the dealer standing on a soft 17. Players’ cards are dealt face up, while the dealer peaks for a blackjack if a ten or ace is showing. When the dealer holds a natural blackjack, all player hands lose automatically. If a player has a natural blackjack, then that hand is a push. The player can double on any two cards. The player also may double after a split. Resplits can be performed up to four hands. To offset the advantageous rules of the game, any time a dealer holds a 22, this is a push if the player holds a 21 or less. If the player holds a natural twenty-one, then a dealer twenty-two still loses. Another rule in the favor of the house is the 1 to 1 payout on a natural twenty-one. In the classic version of the game, this is seen as the worst rule you could play under. In this variant, the rule only offsets advantages, so it’s acceptable. Still, when considering strategy, understand that blackjacks pay much less. When the player switches cards to a combined twenty-one, this is considered a “21”, but not a natural. In this scenario, a dealer 21 would beat this hand. One other deviation from the classic game rules is that players make two equal wagers in blackjack switch. This brings me to an important suggestion. Players must remember they must bet equally on both hands. If they neglect one hand to make the other unbeatable, they are still only breaking even. When switching cards, the player must try to build two strong hands. Because of the dealer-22 rule, some hands you would stand on in convention twenty-one require you to hit. In other words, you have to be more aggressive, because the dealer isn’t going to bust as often. Anytime the dealer is showing a 7 or higher, that’s considered a strong hand and you’ll need to play accordingly. If a 3 through 6 is showing, the dealer’s hand looks weak. If the dealer is showing a 2, this isn’t as weak as you’d expect, because 22 isn’t a bust. When you hold an 18 through 20 and your total beats the dealer’s upcard total (assuming the other card is a 10), then you should place strong bets. For instance, if you hold a 19 and the dealer is showing 8, this is considered advantageous for you. Stand anytime you have a hard 17 or higher. When you have a hard 12 through 16, hit when the dealer has a 7 through ace. Hit a hard 13 or 14 versus a 2. Hit a hard 12 versus a two, three, or four. Stand any other time you have a hard hand against a 2 through 5. Stand on a soft 19 or 20. Always stand on a soft 18 when against a 2 through 8, but hit on a soft 18 versus a nine through ace. When you have a soft 17 or below, always hit before doubling. Double down when you have a 10 or an 11 against a 2 through 6. Double down on a 9 when against a dealer-6. If you have an ace-6 or ace-7, double down against a 5 or a 6. When you hold an ace-5, double against a dealer-6 only. When switching, it’s sometimes good to switch to a stronger winning hand. For instance, let’s say you hold an 18 and a 14, but you have a chance to switch to a 19 and 13. This second combination is considered better. Nineteen is a much stronger hand than eighteen. At the same time, 13 and 14 are virtually identical hands, because in either case, you’re probably hoping for the dealer to bust out. Blackjack switch is a game any jaded classic twenty-one players should try. Not only do the switching rules add a whole other dimension to the game, but the house edge is lower than classic 21, if the rules are the same. You’ll find it a challenge to learn a whole other set of dealer rules. Players will come to hate the dealer twenty-two rule, because it’s going to break your heart several times a session. Players at land-based casinos and online casinos should be able to find the game. Microgaming, Playtech, and most other major online casino software companies have their own version of the game.